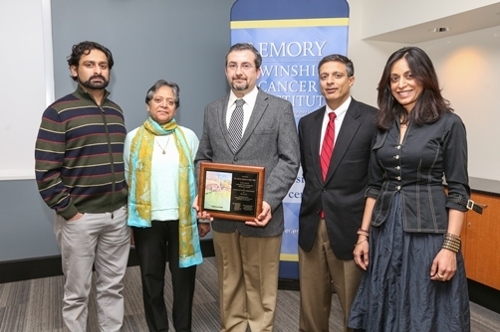 The inaugural Surinder K. Puri Memorial Lecture was held today at Winship Cancer Institute of Emory University with invited guest speaker Ash A. Alizadeh, MD, PhD of Stanford Medicine presenting "Personalized Cancer Detection and Monitoring Using Deep Sequencing of Circulating Tumor DNA". The lecture was established and endowed by Puri's wife, Mridula Puri, MD (Emory Medical Residency, 79'), in loving memory of her husband. In 1965, Puri emigrated from India to United States to pursue graduate work in engineering at Michigan State University. After earning his degree, he spent nearly 50 years working on some of country's largest transit infrastructure megaprojects with the firm of Parsons, Brinkerhoff & Tudor. Puri was instrumental in shaping Atlanta's cityscape and infrastructure starting in 1975 when he began as a top engineer on design and construction of the Metropolitan Atlanta Rapid Transit Authority (Marta) system. Though trained as an engineer, Puri was a true renaissance man who also had the spirit of a poet and sensibility of an artist. He loved building bridges, literally and metaphorically, between places, people, ideas and disciplines. Extraordinarily modest, Puri was beloved and admired by many people for his kindness, elegance, and humor and he loved bringing people together over one of his legendary home cooked meals. In 2004, Puri was diagnosed with stage IV Mantle Cell Lymphoma. He considered himself fortunate to have the best cutting-edge care through his medical team at Winship Cancer Institute. With that care and fortitude he not only survived, but thrived for next ten years until his relapse in 2014. Puri profoundly benefitted from great advances in research and clinical care for cancers of B-Cell malignancy variety. With this lectureship, Puri's family hopes to accelerate further significant advances in this area, and to extend those benefits to as many others as possible by bringing in top researchers and clinicians to share their work and foster opportunities for multi-institutional collaboration. Pictured: Saurabh Puri, Dr. Mridula Puri, Dr. Ash Alizadeh, Dr. Sagar Lonial and Shaifali Puri.